Sold and fulfilled by B2A UK (4.4 out of 5 | 463 ratings). 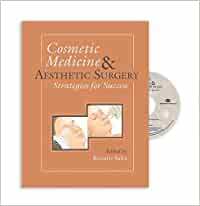 Cosmetic Medicine and Aesthetic Surgery: Strategies for Success is a must for aesthetic surgeons interested in incorporating cosmetic medicine into their practices. It is also a lifeline for surviving the economic downturn. This is the right book at the right time! It offers surgeons the tools they need to meet the increasing patient demand for nonsurgical, minimally-invasive, anti-aging procedures. The editor, Dr. Renato Saltz, is one of the visionaries in the field who has been in the forefront of plastic surgery advocating cosmetic medicine. He has chosen contributors who are experts from different specialties-plastic surgeons, dermatologists, aestheticians, and practice management consultants; they share their expertise and practical advice to provide readers with a virtual goldmine of information. An Invaluable Resource This landmark work, the first of its kind, is packed with practical information on the financial and business aspects of cosmetic medicine as well as the step-by-step clinical descriptions of noninvasive procedures. It begins with a key chapter by Dr. Saltz, Cosmetic Medicine: The Writing on the Wall, which focuses on current trends of patient demand and how cosmetic medicine can help aesthetic surgeons keep their practices busy and viable when requests for more invasive surgery are lagging. Dr. Saltz and his expert contributors show by example how cosmetic medicine services and products can breathe new life into an aesthetic surgery practice-appealing to a broader demographic consisting of young patients, baby boomers, and older patients. It is the key to practice growth and patient retention, helping aesthetic surgeons retain patients from the first visit for a nonsurgical procedure to a surgical procedure later to treat more aggressive aging changes. Practical and Comprehensive This book has something for everyone. Divided into four parts, it contains 28 comprehensive chapters. Part I includes five chapters, written by surgeons who practice what they preach. They provide pragmatic advice on choosing a practice model for incorporating cosmetic medicine into your existing surgery practice. Options range from office-based facilities in a private practice or academic setting, adjacent facilities, free-standing spas, and multi-specialty centers. Throughout each chapter, the authors focus on the advantages and disadvantages of each practice model along with specific financial and business issues that need to be considered. Part II is devoted to the Business Aspects of Cosmetic Medicine. It includes the nuts and bolts of financial and business advice for preparing a business plan, developing a financial model, staffing, marketing, and legal preparations relevant to providing cosmetic medicine products and service. Parts III and IV contain the clinical chapters, with step-by-step advice on the range of services and product options to offer as part of your cosmetic medicine menu. These chapters include information on skincare and makeup products, botox and fillers, fat grafting, laser therapy, IPL and radiofrequency, hair removal, peels and cosmeceuticals, and vitamins and hormone therapy. The last chapter, Secrets to Success, offers valuable advice for opening and sustaining a successful cosmetic medicine business within your surgical practice. Key points and "take-away messages" are included in each chapter. Numerous preoperative and postoperative photos demonstrate results of combined surgical and nonsurgical procedures. Start reading Cosmetic Medicine and Aesthetic Surgery on your Kindle in under a minute.